Victor’s Kitchen on Bencoolen Street serves amazing Har Gow prawn dumplings. 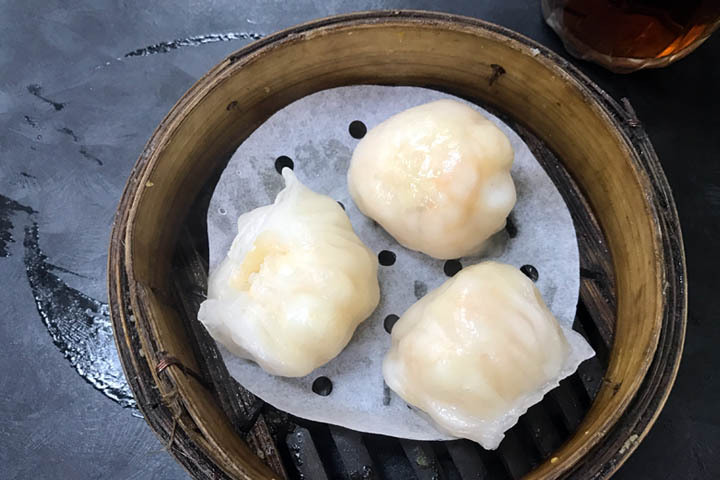 It is a bold statement, but in my quest to find the best dim sum in Singapore I can’t go beyond the Har Gow at Victor’s Kitchen. It is a humble establishment that first setup in 2004 inside the Sunshine Plaza. The place looks rustic with its cheap metallic tables and tightly packed plastic chairs, but we don’t come here for the ambiance… we come here to eat cheap and tasty dumplings! Before I go into the food, I want to start by saying the customer service sets Victor’s Kitchen apart from its competitors. A lot of cheap eateries focus on turning tables, however whenever I visit Victor’s Kitchen, I am warmly greeted and the staff even volunteer suggestions on what is good to eat! Granted the staff are running around like crazy, squeezing between the tables to serve you your dim sum, but they seem happy to be there which makes a difference. Victor’s Kitchen serves Hong Kong style dumplings. To place your order, you tick which dim sum you want on the paper menu card and then hand it to the cashier and make payment up front. There are photos of all the dumplings at the back of the restaurant, above the open kitchen. At the top of the menu are the prawn dumplings, also known as Har Gow. These dumplings were the highlight of my meal. 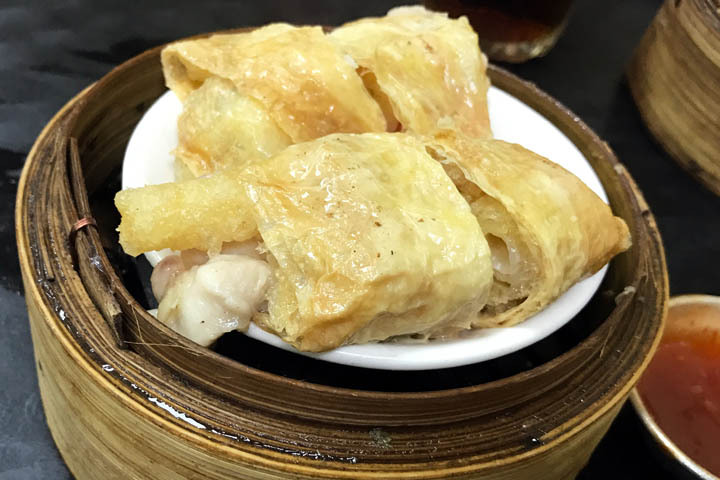 They are generously filled with three king prawns and steamed in a smooth, translucent wrap that is just sticky enough to keep the dumpling from falling apart without tasting gluggy. Other dim sum restaurants often fill their Har Gow with one or two prawns only, together with prawn mixture. However Victor’s Kitchen do not skimp on fillings. The queen size Siew Mai are another big seller. They are made from lightly seasoned ground pork, steamed in yellow lye dough and garnished with a dot of crab roe. Whilst these are a classic Chinese dumpling they are not something I particularly seek out. 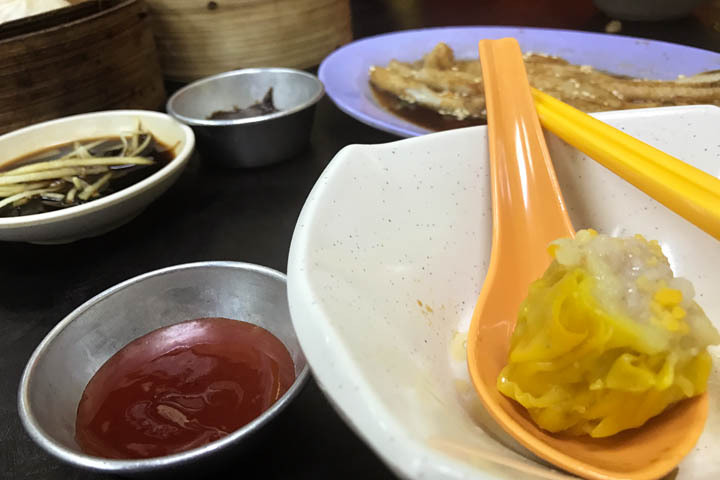 However at Victor’s Kitchen, you can taste their Siew Mai is made from good quality pork and it is not overcooked, so the dumplings are plump and juicy. A dumpling house is often judged by the quality of their Xiao Long Bao. The soup dumplings at Victor’s Kitchen strike the right balance between meatiness and soupiness. They are filled fully for their medium size and the pork is well seasoned. These dumplings are best eaten quickly, while the soupy mixture is hot and delicious. 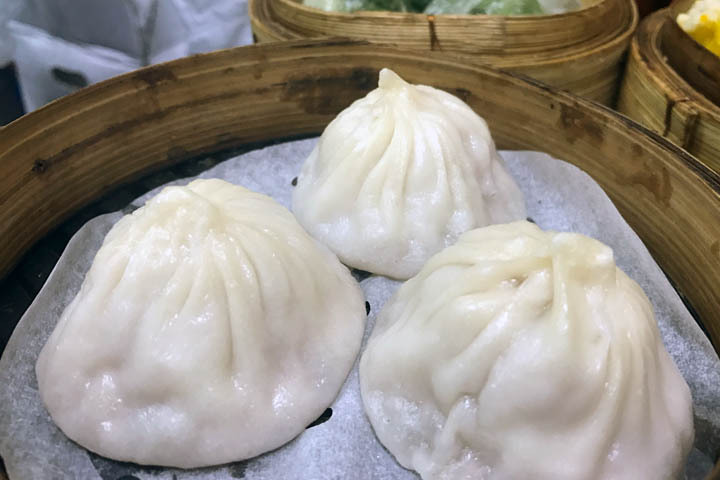 It is hard to limit yourself just to one dumpling, so if you are with a group you might want to order a few steamers of these as there are only three Xiao Long Bao per portion. If you feel like you need some greens during your meal, order a portion of prawn spinach dumplings. 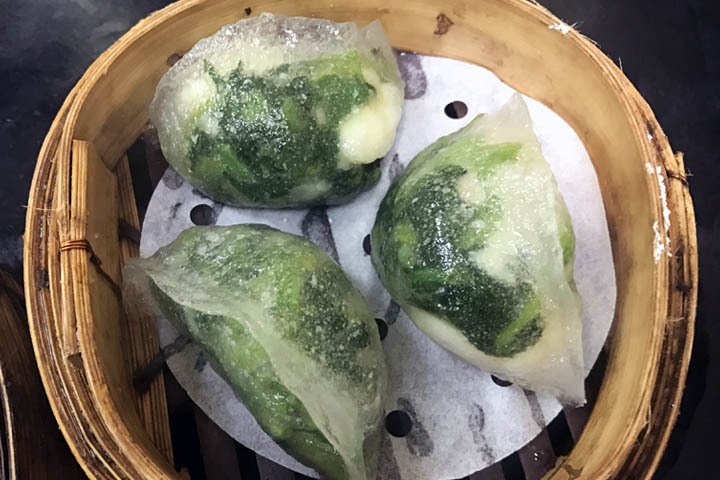 These moon shaped parcels are wrapped in a clear, glutinous paper and packed full of fresh tasting Chinese spinach that is only light steamed so there is still some crunch in every bite. 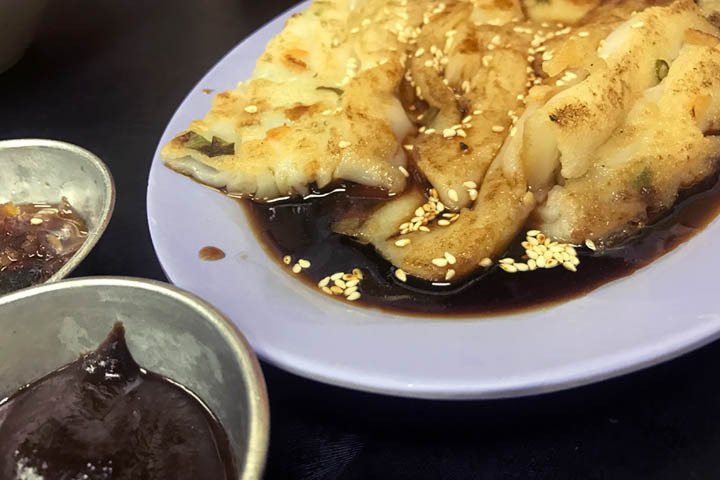 Their range of rice noodle dishes, also known as Cheong Fun, are good also. My favourite is their poached Char Siew Cheong Fun that is generously filled with cubes of red-coloured BBQ pork. However I also enjoyed their Hong Kong Style Pan Fried Cheong Fun. The rice noodle is stuffed with spring onion, fried to a crispy yellow colour, and sprinkled with sesame seeds. It comes served with a side of marinated pork pieces, which complement the noodles well. You must order a portion of the poached Szechuan dumpling served in spicy sauce. 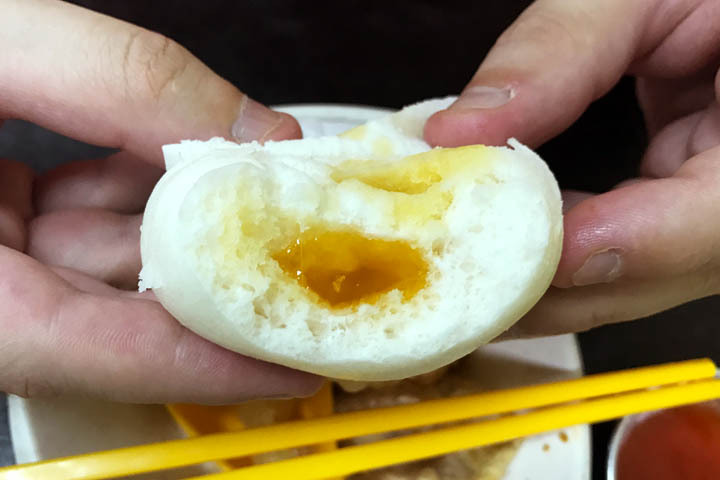 These are a Hong Kong classic! They are smallish and crinkly-looking pork and chive steamed dumplings encased in a soft and silk-like dough. Quite often they are served in soups, but they are just as delicious with plenty of soy sauce, garlic and chilli. However more fresh chilli would not go amiss! Many of you reading this are probably waiting for me to talk about their famous Golden Egg Yolk Lava Bun. Sorry folks, I am not a fan of eggs. However my partner tried this and reported the bun was light and fluffy and the filling was oozy and sweet. If there was one criticism I had to make of Victor’s Kitchen, it would be of their steamed seafood maw rolls, which is one dish that could be removed from the menu. It is a weird combination of chicken, crab sticks and other unidentifiable ingredients steamed in a papery wrapper. The ingredients didn’t work well together and the rolls fell apart when I tried to eat it with my chopsticks. 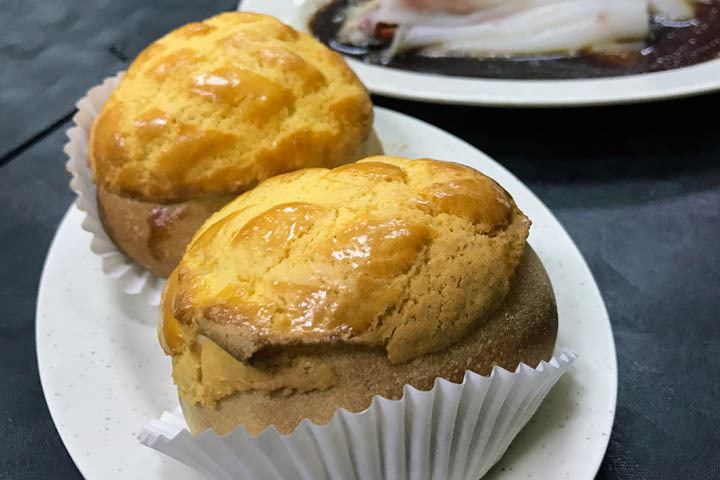 For dessert, please do not go past the Char Siew butter buns. The buns are lightly baked and glazed to produce a golden, slightly crumbly hued crust. Take one bite and lots of warm sweet BBQ pork rushes out. Gobble it up quickly! Divine golden goodness filled with pork! Some people complain that Victor’s Kitchen is not as good value for money as its competitor Swee Choon. However I argue that it is better value. 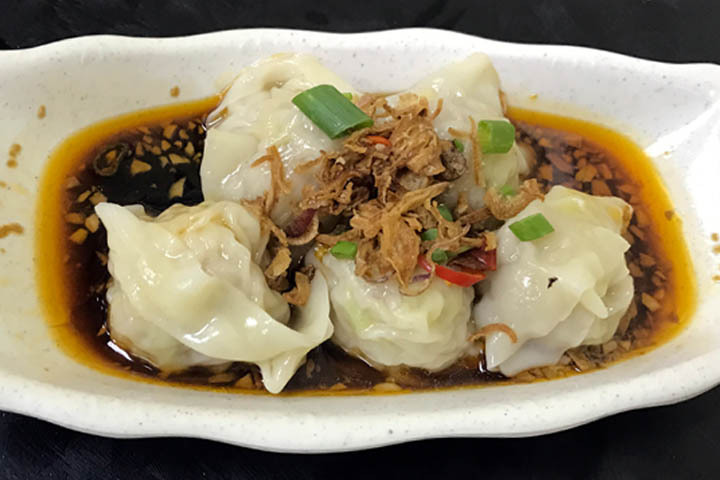 Although the portion sizes are smaller (mostly three dumplings rather than four dumplings per serve), all the dumplings are generously filled with the best quality ingredients. The Har Gow at Victor’s Kitchen are a testament to that, and you can tell that Victor’s Kitchen does not take shortcuts. And where else in Singapore can you enjoy a dim sum brunch where the serving staff are friendly? However one tip for Victor’s Kitchen… please stock some decent chilli sauce! !